in the High Desert. 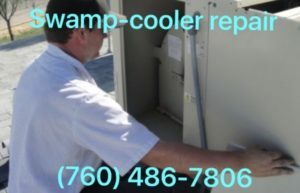 Swamp cooler maintenance with High Desert Plumbing in Victorville , Adelanto, and Barstow California Areas. Evaporative Coolers are common locally in San Bernardino County. Also known as ‘Desert Coolers’, these air cooling units are not easy to repair and sometimes dangerous. Blowing warm air is the most common complaint regarding swamp coolers. There are different reasons the air can stop blowing cold, such as a leak in the pan. If your swamp cooler has not been serviced since last summer you probably need a basic servicing. Order a plumber to get more details. Swamp Cooler repair with this company is a breeze. Whether the fan belt needs replacement, or a simple breaker switch is off, our technicians are honest and fair. In short, cooler repair is cheap and easy with us. Another common problem for evaporative coolers is the water pump. While the fan is blowing water is pump through a system of tubes, therefore ,sending evaporated water through the air. This means if your cooler is blowing warm air, you are wasting energy and money on utilities. Plumbing the High Desert since 2012, in addition to swamp cooler service, we do water-heater repairs, drain cleaning (rooter service), in addition to, leaking pipe repairs. Plumbers available in Barstow, Victorville, Hesperia, Apple Valley, Helendale, Yermo, Adelanto, Ore Grande, and Lenwood. This company does not work on A.C units or repair air-conditioning parts. Most uses for these coolers are in hot and dry areas like deserts. 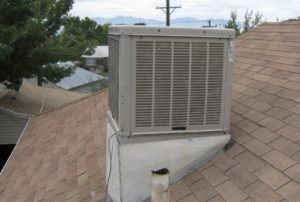 Repairing an evaporative cooler, otherwise known as a swamp cooler, is energy efficient. Some parts are available at this home depot page. In conclusion, this method is very successful at ‘beating the heat’, expect to find a variety of brands to choose from. Call today to avoid getting burned by our competition. Free estimates over the phone and all work is guaranteed.